This is a large and beautiful 1942 World War II era map of the Malay Peninsula (Malaysia) and Sumatra, Indonesia, issued by the Survey Bureau of Manchuria State. 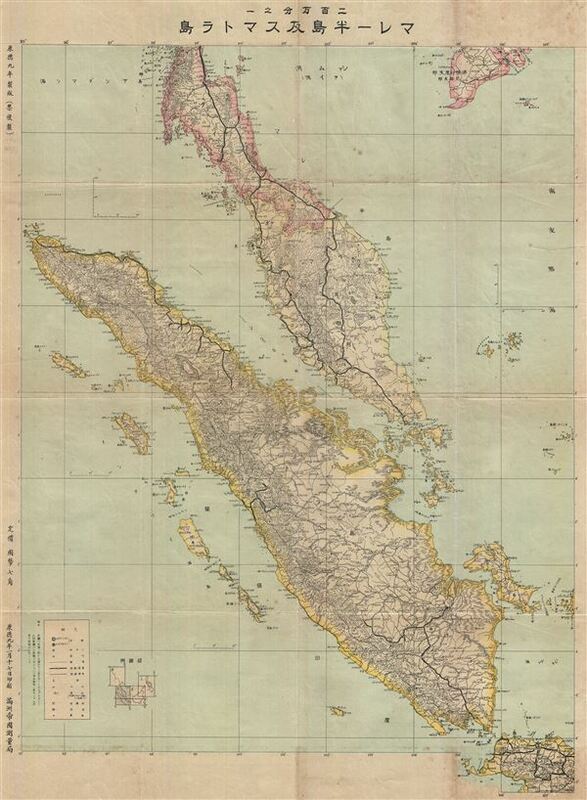 The map covers the Malay Peninsula, including Singapore, as well as the island of Sumatra, Indonesia. Issued shortly after the capture of Malaya and Sumatra by the Japanese Army, this map notes numerous towns, cities, rivers, railways, islands and topography. A legend is included in the lower left quadrant. All text is in Japanese. This map was issued by the Survey Bureau of Manchuria State in 1942. Very good. Minor wear and toning along original fold lines. Professionally flattened and backed with archival tissue. Overall age toning.